Looking for blight: Is Vanderbilt Avenue part of an <em>area</em> that is "determined to be substandard and insanitary"
Looking for blight: Is Vanderbilt Avenue part of an area that is "determined to be substandard and insanitary"
So, there's no checklist to help us define blight, according to the Empire State Development Corporation's (ESDC) testimony at a hearing Tuesday, just a report that ESDC board members--lay people who don't visit the neighborhood at issue--uses to conclude that the conditions are "substandard and insanitary." That's pretty vague, dangerously so, according to attorney Norman Siegel, who represents plaintiffs challenging eminent domain for the Columbia University expansion. I prefer a different definition of blight, from urban planning professor Lynne Sagalyn: "When the fabric of a neighborhood is shot to hell." But a friend suggested an easier measure: "If you're within five minutes of getting decent cappuccino, there can be no blight." 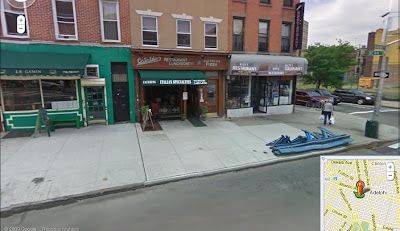 Well, as the photo (via Google Maps) shows, on Vanderbilt Avenue below Dean Street, right across the street from the southeast block of the Atlantic Yards site (destined for interim surface parking), there are three restaurants, part of a vibrant shopping strip. I don't know if the luncheonette at the corner and pizzeria just to its south serve cappuccino. But the third restaurant, Le Gamin, sure does. A site or an area? In testimony Tuesday, ESDC General Counsel Anita Laremont said the statute refers to an "area [that] is determined to be substandard and insanitary." In other words, lay people should understand that the area is not defined by the specific parcels coveted by developer Forest City Ratner but should be looked at a bit more holistically. And then, a reasonable person might conclude that other measures less extreme than eminent domain--like a rezoning (a suggestion that, when proposed, led the ESDC to punt)--might have been effective in removing blight. After all, there's a historic district very, very nearby. In fact, the restaurants shown are in the historic district. 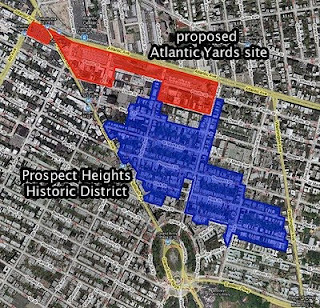 It would be amazing if a group of people or graduate students looked at the same criteria used to determine blight in the Atlantic Yards and applied it to the rest of the city. I would love to see the map showing that almost the entire city is blighted.